I've "met" a lot of people through blogging. I "virtually" know so many people! I have really only met very few of them in real life though. 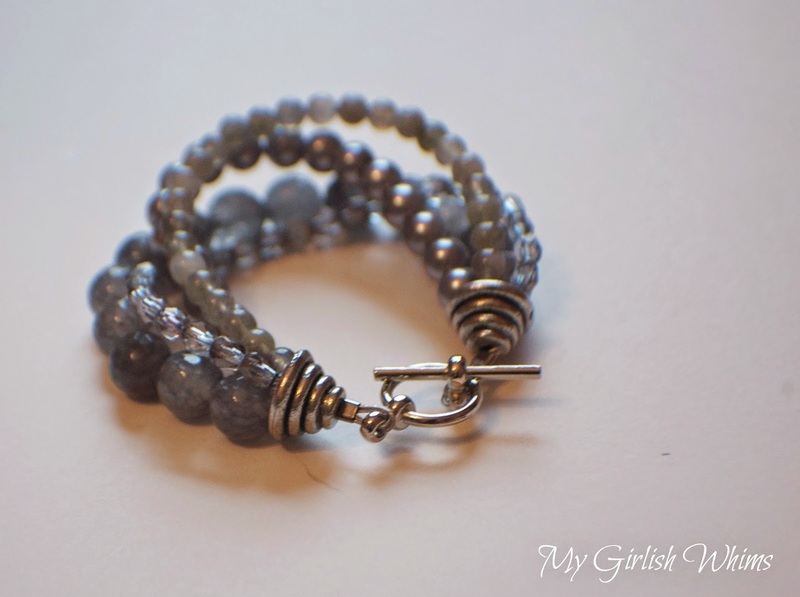 One such blogger that I HAVE been lucky enough to met in real life is Suzette Bentley of Ellie's Bijoux. We were members of the Cousin Creative Circle for a little over a year together and got to meet on our trip down to Cousin headquarters. I have so much admiration for Suzette: she is SUPER friendly and nice and makes BEAUTIFUL jewelry. She is so talented! She has made jewelry making her way of life and recently launched a new business selling jewelry components called Elements of Antiquity. Elements of Antiquity is an online shop that sells aged pewter jewelry components that are 100% made in the USA, lead free and nickel free. Suzette sent a couple pieces my way to play with and I chose to make a multi-strand bracelet with the aged pewter beehive bead caps! Bead caps are a pretty staple jewelry making component but I have always had a terrible time trying to find ones I like either in local bead shops or online. So I was glad to have the opportunity to use these caps with a simple but elegant bracelet design. Here's how I made it! I first laid out a pattern of beads I wanted to use. 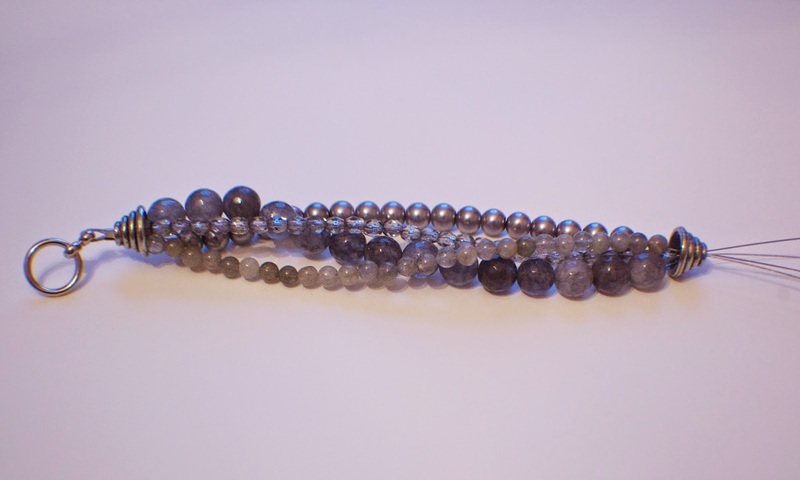 I chose a grey mix of various size stone round beads, faceted Czech glass beads and faux pearls. 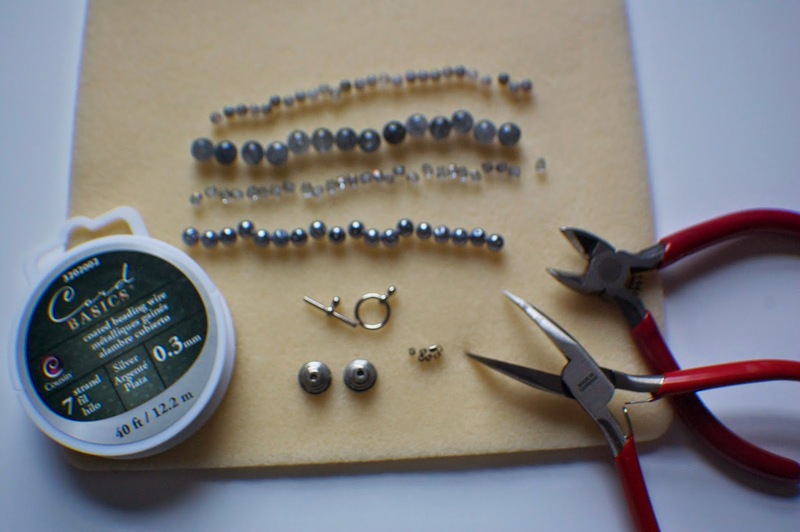 Other supplies needed are crimp beads, a clasp, beading wire and some beading pliers. 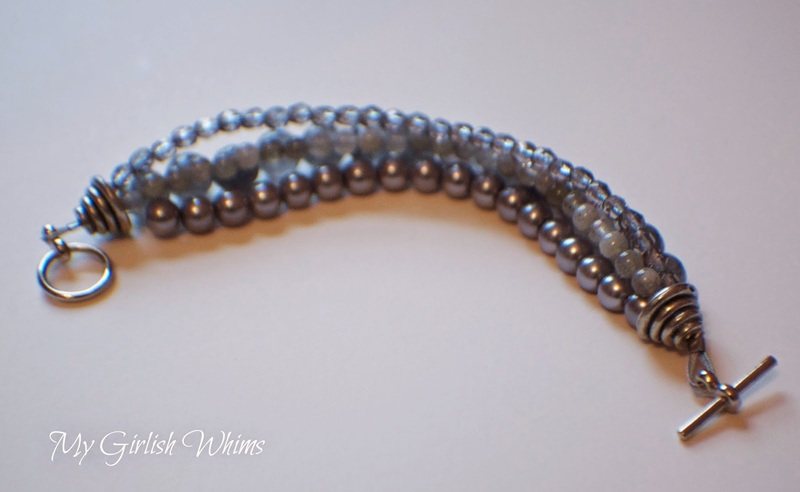 I cut four strands of beading wire using wire cutters and strung on each type of bead. 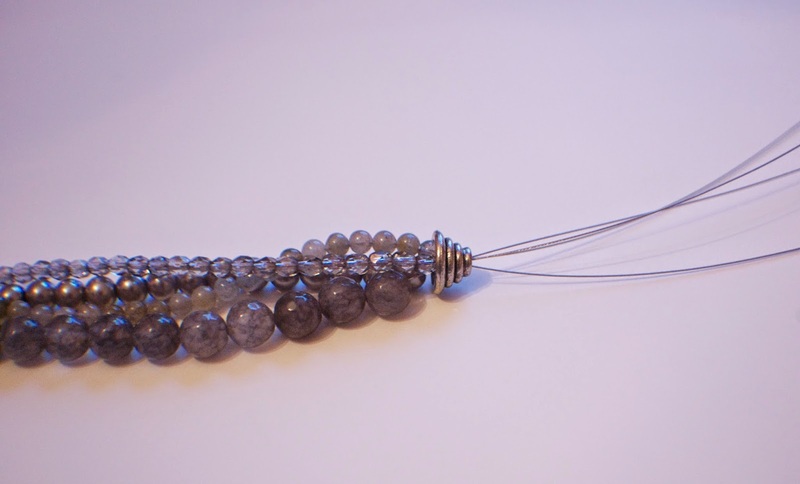 I recommend using scotch tape to secure one end of the beading wire while you are stringing, this will make the strands easier to work with later on. 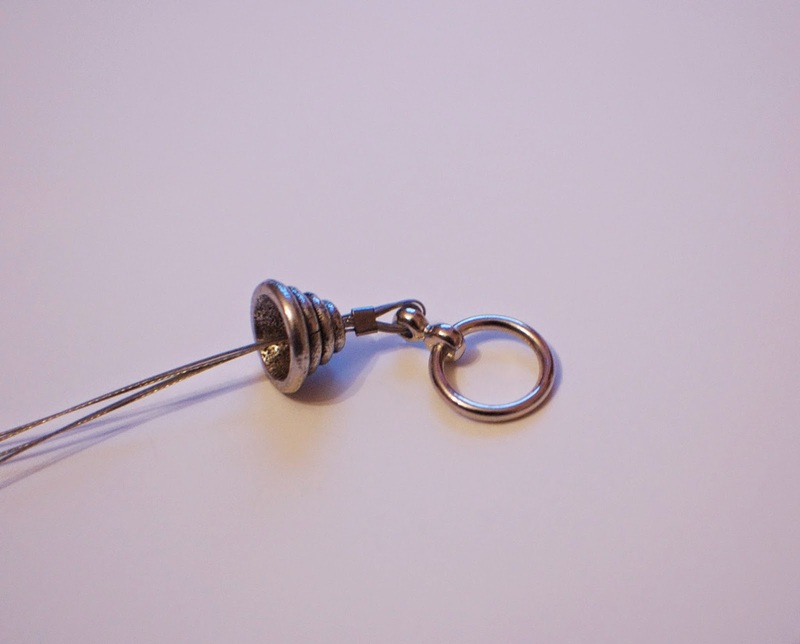 After all my beads were strung I gathered the open ends together and strung on a bead cap. 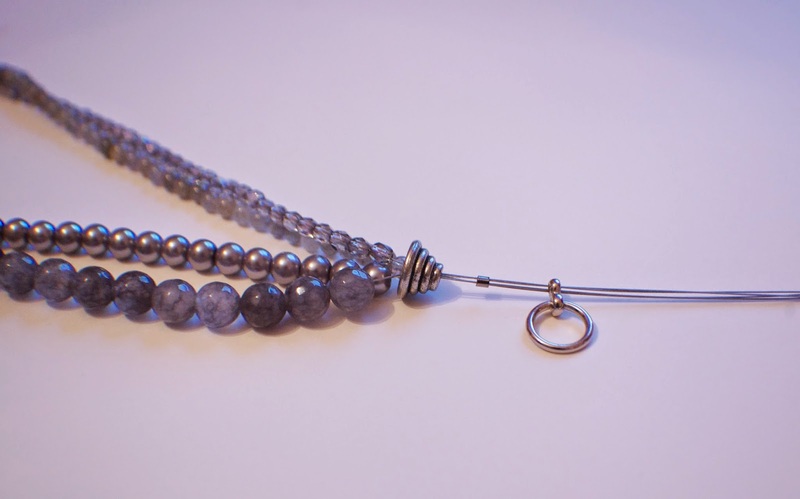 Wrap the wire ends around and back through the crimp bead and use needle nose pliers to crimp the crimp bead flat to secure the clasp. Use wire cutters to trim off any extra wire tails. 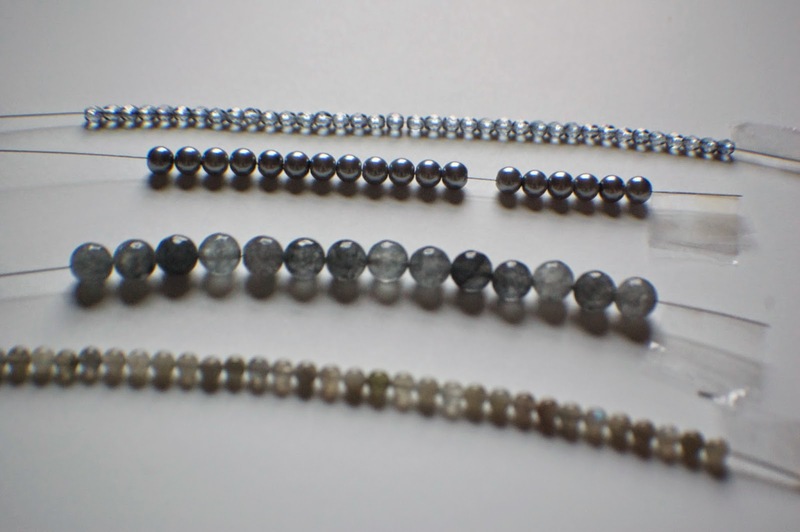 Next arrange your lengths of beads to the size of your wrist and after you have a proper length string the other bead cap on the other end of the wires and repeat the crimping process again for the other side of the toggle clasp. 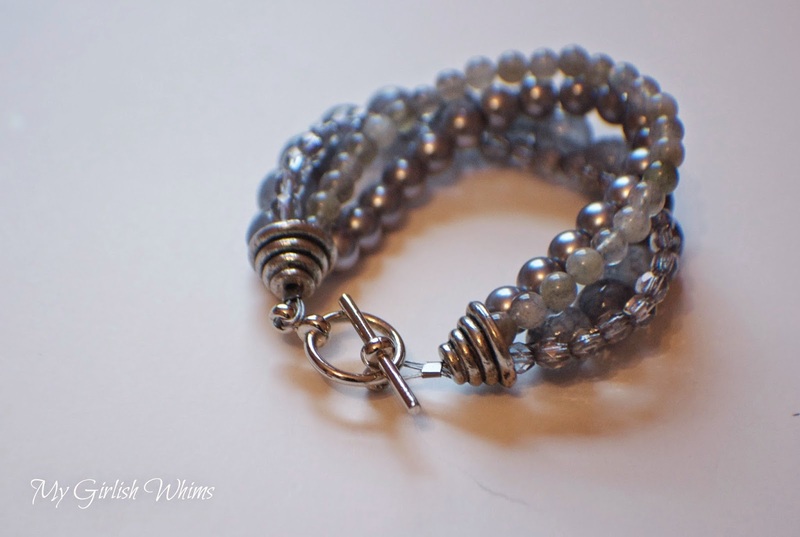 After all the wires have been crimped in place you are left with a pretty silver beaded bracelet! Elements of Antiquity offers lots of beading finding components but they also stock various kinds of charms and pendants. There are plenty of pieces to inspire your next jewelry creation so if you have a minute hop over to take a look!